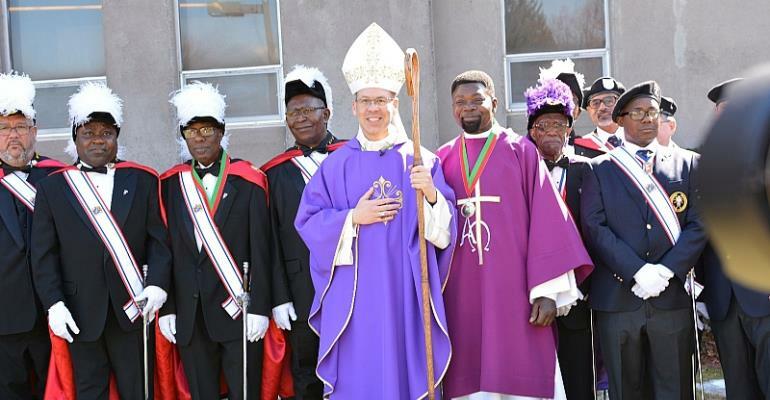 The Roman Catholic Arch Bishop of Hartford in the State of Connecticut, Most Reverend Leonard P. Blair established by a Decree, the first ever Ghanaian Catholic Quasi-Parish on December 6, 2018. 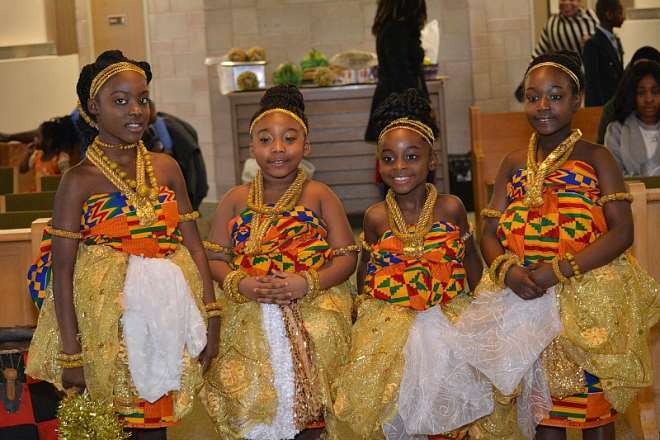 In true Ghanaian fashion, the new parish with her new moniker, The Saint Isaac Jogues Ghanaian Catholic Quasi-Parish celebrated the historic inauguration and installation of their new Ghanaian Pastor, Reverend Father Paul Baffuor Awuah, with a vibrant and culturally centered event on Sunday, March 17, 2019. 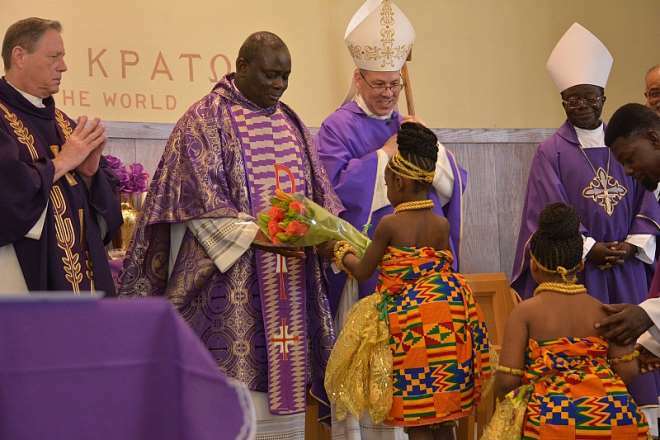 The occasion was celebrated by the Most Reverend Juan Miguel Betancourt, the Auxiliary Bishop of Hartford and Most Reverend Joseph Osei-Bonsu, Bishop of Konongo-Mampong Diocese. In attendance were several Catholic Priests, Deacons, and leaders of Ghanaian Associations from the various states and Apostolates. 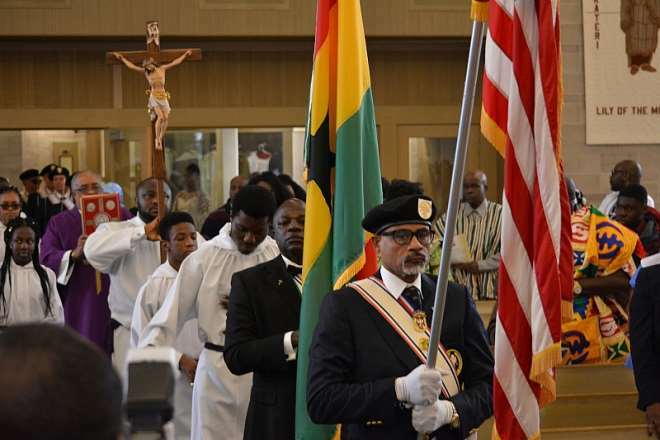 Also present was State Senator Saud Anwar of Connecticut and the executives and members of the Laity Council which represents the various Ghanaian catholic fraternities in the United States. The church, which began as a ministry Twenty-Two years ago by four visionaries, namely, Mr. Edward Adjei Kensah, now Deacon; Mr. Robert Bentil, Nana Yaw Bonnah, and the Late Mr. Mathias-Onyina-Assenso, who was inspired after a pastoral visit to New York by Bishop Kwasi Sarpong, now Archbishop Emeritus of Kumasi. The town of East Hartford became the locus for the church, because it had about 90% of the Connecticut Ghanaian immigrants. Having laid a strong and a formidable foundation for the Ministry, and as the church began to grow, Rev. Nana Ampah, the first Priest of the new ministry consulted with Bishop Joseph Osei Bonsu of Konongo-Mampong Diocese in Ghana to inaugurate it. Consequently, on August 27, 2000, the Ministry was inaugurated by Bishop Bonsu. With the help of Brother Myles Hubbard, the then President of the Black Catholic Ministry and Msgr. Johnson, then Vicar for Priests for the Archdiocese of Hartford, there was a move to have a contractual agreement between the two Bishops of the Archdiocese of Hartford and the Diocese of Konongo-Mampong to send resident priests from Ghana to serve the Ministry for a four-year term. The first Resident Priest for the Ministry was Rev. Fr. Augustine Owusu-Sekyere. He was followed by Rev. Fr. Joseph Savino-Gyimah, Rev. John Kyere and now Rev Paul Baffuor-Awuah, who is the new Pastor of the new Quasi-Parish. The church has had four successive leadership since its inception, The first elected Council was from 1997 to 2001, led by Mr. Edward Adjei Kensah and Nana Adansi Bonnah as Vice President; 2001 to 2007, led by Mr. Edward Adjei Kensah as President and Mr. Robert Bentil as the Vice President. From 2007 to 2010: Second Elected Council with Mr. William Pinamang as President and Mr. Larry Bempong as the Vice President. From 2010 to 2017: Third Elected Council with Mr. Larry Bempong as President and Mr. Emmanuel Ewusi as the Vice President. From 2017 till date, the Fourth Elected Council has been led by Mr. Thomas Andoh as President and Mr. Fred Kwadwo Kyeremeh as the Vice President. The church is now proud of about 400 members and is blessed with five Ministries, eight societies and seven Committees. They also have a Music Ministry, Ushers, Lectors, Eucharistic Ministry, the Youth and Sunday School. The new Pastor and church council wish to express their sincere appreciation to all well-wishers and Parishioners of the newly formed St. Isaac Jogues Ghanaian Quasi –Parish for their fervent prayers, support and sacrifices over the past 22 years; and for the opportunity to practice their Catholic faith in their language and culture. They pray that the good lord will continue to bless the new Parish from strength to strength.